So does selling options have a good return? Does the model proposed in this working paper accurately describe the mechanism that causes high beta to be overpriced? First of all, the mere existence of leveraged ETFs (at high fees!) 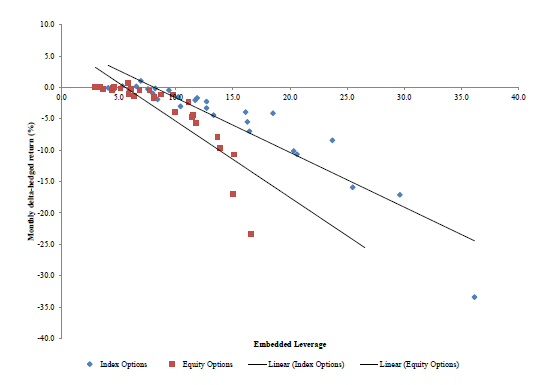 and options is evidence that some people demand embedded leverage. These products were designed precisely for that reason. Third, regarding puts, you must not forget put-call parity: if calls get expensive, so do puts. Further, puts provide embedded leverage on the short side so there is an independent reason for these to be expensive. In summary, we have a theory that can help explain the cross-section of equities, treasuries, and credit markets, the time series, the beta compression during crises, and investors’ actual portfolios (“Betting Against Beta”), the returns across asset classes and the efficacy of risk parity (“Leverage Aversion and Risk Parity”), the existence and pricing of securities with embedded leverage (the paper you asked about), and the performance of Warren Buffett (“Buffett's Alpha”). Not bad for a simple theory. Of course, your behavioral effects can play a role too and the two views can complement each other. Well, I like that your theory explains lower returns on embedded securities like 2x ETFs, and lower returns on high beta stocks. I especially like the fact the BAB portfolio is significantly correlated with ted spread. What I find anomalous are the existence of 'embedded leverage' assets with not merely negative alpha, but with 'lower than average' returns. Levering up to get more of the 3-5% equity premium is not rational if their return is below the risk-free rate as it is for many of these categories (often negative in absolute returns). Your theory seems to explain an insufficiently positive sloping SML, but not a negative sloping one. If this effect were constrained to puts, it would make sense, but it's not.